Just click on the update button and quit vectorworks (two separate apps running). Once updated, it will begin the process of installing the SP1. Nope, I get nothing. On windows 10 btw, anybody else having trouble? I quit Vectorworks before launching the updater too. Not working in exactly the same way as the original post describes, or are you getting different behavior? We've had one other instance of this so far, and it looks like it was related to the user's firewall settings. We simply disabled it entirely on their machine and then ran the updater again. I will check with support and see if they've had other cases, but I suggest trying that for the moment if you have control over your local and/or network firewall. Jim I did what you suggested and it had no effect for me, I disabled the firewall and virus protection. The screen is the same as jstroming. Same as uglycat, it did not work for me! Disable both Antivirus & Firewall. 2. The Updater can launch and install vwx updates without launching vwx and clicking the Check for Updates. A. I attempted to update via the Updater App (vwx is not launched) by dbl clicking the Updater App in Applications> Vectorworks 2019 folder. B. Updater launched, but initial screen indicated I needed to Refresh the Updater which offered an Update button (wish it was labeled "Refresh"). D. Clicked the Update button. A progress bar appeared and completed. E. An Up to Date notice appeared and offered a Launch button. F. Launch was successful. v2019 responds to navigation, tool use, etc. •The Check for Updates button in the Vectorworks menu launches the Updater App in background, but is incapable of forcing Updater App to Refresh. Benson, Thanks for your input but no luck with that. By your nomenclature it sounds like you are running a mac so its possible there is no issue on that side of things. 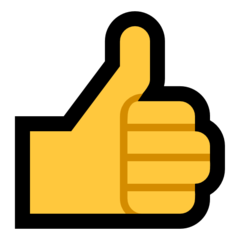 I can add that I was successful installing the update on another windows 10 pc with no issues, just the work system that is having this problem. I will add too that the system the install worked is using an AMD video card and this one is on an Nvidia if that matters. I submitted a request to tech support. My update did not work first try. I thought it was same or similar issue. On reflection, it was more likely a slow internet connection and what I saw was the updater app refresh stalling out. I tested the connection speed (about 1 mbp) rebooted the modem (improved to a blazing 10 mbp), then launched the updater app with Vectorworks not running. It refreshed and updated successfully. Anyway, sorry you are having trouble and hope it gets solved soon. I tried @uglycat's suggestion but no luck for me! False positive security alert it looks like. No danger for you there @uglycat, those two items are ours. However, it does indicate that you have security software that is definitely thinking Vectorworks is a threat. 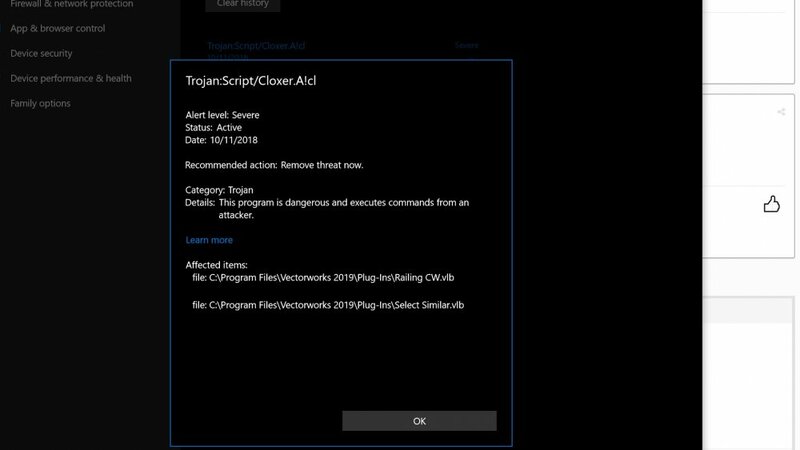 Is this just Windows Defender in the screenshot here? We may be able to add the entire Vectorworks 2019 folder to it's exclusion list to prevent it from stopping the updater or giving you other alerts like this. If that software already removed any of those components however, they will stop functioning fully in Vectorworks and we might need to have you perform a reinstall after we get your security settings under control. Hi Jim, this was just Windows defender. As soon as I turned it back on I got the message as well as a message from vectorworks that notified me the two files were altered and couldn't be loaded. No history of any virus/Trojan issues. Its very unlikely you actually have a virus or trojan of any kind, sometimes protective software incorrectly misidentifies our tools as such because we use common python libraries and other external resources. We just need to tell Windows Defender to ignore it. Go to Start > Settings > Update & Security > Windows Security > Virus & thread protection. Under Virus & threat protection settings, select Manage settings, and then under Exclusions, select Add or remove exclusions. There should be an option to add Folder, add the Vectorworks 2019 folder completely, then confirm the exclusion and restart the machine. Launch Vectorworks and let me know the results. You should try and use the Select Similar tool as a test, if it works, then you can likely resume working. If it fails, we may need to run a Repair. Jim the select similar tool is missing as I had the system remove the suspect files. Is there a way to reinstall those two tools without a full reinstall? Launch the Vectorworks 2019 Updater application, it should be in a folder of the same name in the Vectorworks 2019 application folder. On the right side, click the Advanced menu, then click Repair. This utility is new in 2019, if this does not work, we can do a reinstall. I used the updater as you said to repair the installation and it replaced the two missing plugins that were deleted. I also added the Vectorworks folder to the Exclusion list, everything seems ok at the moment. Thanks for your help. I'm also having trouble getting the updater working. I'm getting caught in an endless cycle of the screen that says "updater needs to refresh" Has anyone found a solution for this yet.